Among our beautiful staff, I witnessed a lot of strength, a lot of heart, a lot of grace, a lot of generosity. And as so many of us surrounded Noah in his final moments, I sure did feel a lot of love. I held on to that love and took it with me as I said goodbye, from all of us, to Peabody. On a difficult day, that was one hell of a gift. When animals fall ill at Catskill Animal Sanctuary, we try mightily to bring them back to health. All good sanctuaries do that: “our” animals are our families. We celebrate each one’s healing, and we cherish them all. When we lose them, we lost a piece of our hearts. 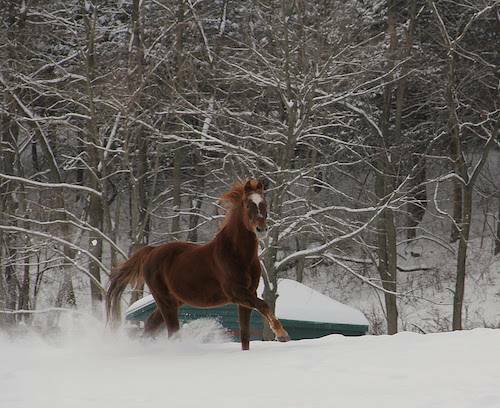 Yesterday, we lost two of the most precious animals Catskill Animal Sanctuary has had the privilege to know. In the course of three hours, we lost our beloved old horse Noah and our beautiful rooster Peabody. 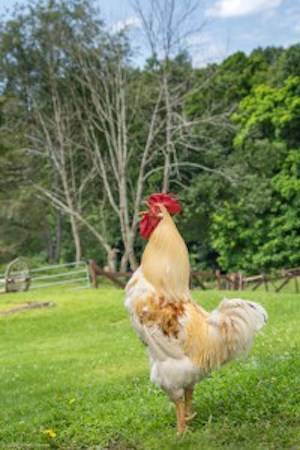 Noah called Catskill Animal Sanctuary home for over 10 years, and Peabody the rooster likely convinced hundreds of visitors to stop eating animals as he raced to us when we called his name, fell asleep in visitors’ arms, or gently nuzzled their cheeks. Noah arrived in 2006 crippled by flagrant and long-term neglect; it was doubtful whether he could live a pain-free life. His dramatic rescue, and his truly miraculous recovery, is told in the revised edition (the paperback) of Animal Camp. After many months of reshaping grotesquely malformed hooves and slow, careful rehabilitation, what a joy it was to take him out to a large pasture for the first time and watch as he galloped, pain-free, to the far end. For those who knew and loved this kind and gentle old boy, I deeply regret that we shared our wishes for his healing the day before we euthanized him. Many of you probably know that Facebook posts can be scheduled: they can be written on Wednesday, for example, and scheduled to go live on Friday — this exact schedule is precisely what happened with the Noah post. I wrote it on Wednesday; it was scheduled to post on Friday. In between those days, we watched our sweet friend fall apart. Overnight, he lost his ability to chew hay, and could no longer keep his tongue in his mouth. His gate was unsteady; when he turned in his stall, he bumped into the wall. A stroke is one possibility. During that time, honestly, I wasn’t thinking about the Facebook post I’d written on Wednesday. I was thinking about Noah. Just as we were celebrating the healing of Noah’s eye after four months of intensive treatment, we watched, crushed, as one thing after another went wrong in rapid succession. It was clear not only that his quality of life was gone, but also that, if we failed to make the decision to euthanize him, he very possibly would have died alone and suffering terribly. We chose to let him go, and he was surrounded by love — so much love!!! — as he went peacefully. Peabody’s death was altogether unexpected. Animal caregiver Ashley found him yesterday morning struggling to breathe. Caregiver Cerri rushed him to Hurley Vet, who tried for most of the day to help him. But even having him on an oxygen machine AND “supplemental oxygen” being delivered by a port inserted into his air sac (the vet explained that this was essentially a tracheotomy for chickens), our precious, precious Peabody was still struggling to breathe. I was there for a long time watching him. It was grim. The vets tried their hearts out, but they simply couldn’t determine the source of his distress. One initial plan was to rush him to Newburgh, where one of the nation’s leading bird experts has a practice, for an endoscopy. But vets at both practices felt that Peabody’s prognosis was “extremely guarded to poor,” and much more to the point, he could not have made the trip to Newburgh. He’d have suffocated en route. And so it was, that on behalf of all of us who loved him, I kissed our beautiful boy many, many times, told him that he’d been a remarkable teacher and friend, thanked him for the memories, and massaged his little neck as he went to sleep. Yesterday was a reminder of how much our work matters, and of the importance of being a family working together toward our vision of a world free from suffering. Among our beautiful staff, I witnessed a lot of strength, a lot of heart, a lot of grace, a lot of generosity. And as so many of us surrounded Noah in his final moments, I sure did feel a lot of love. I held on to that love and took it with me as I said goodbye, from all of us, to Peabody. On a difficult day, that was one hell of a gift. I love and honor the staff and volunteers of Catskill Animal Sanctuary — those who have the heart and mettle to do this work that is mostly joyful, always difficult, and sometimes heartbreaking. And I honor and appreciate those of you who contribute financially to make this work possible, even on the most difficult days. How we will miss our boys. Please, friends, share your memories with us.